The dream of achieving a low maintenance and drought tolerant landscape is not as daunting as it sounds. Follow these seven well-tested principles and you will achieve a landscape less dependent on water and environmentally sound with healthier plants that require less fertilizer, chemicals and maintenance. Evaluate your property and develop a list of objectives that match its physical features and microclimates. Observe and work with nature. Select natives and purchase improved plant varieties that will tough it out in your environment. Create more hardscape areas that require no water and little maintenance. Have your soil analyzed for free. Soil sample boxes and forms are available at your local office of NC Cooperative Extension. Amend the soil as advised. Make your own plant food in the compost bin. Break up the soil to promote water infiltration. 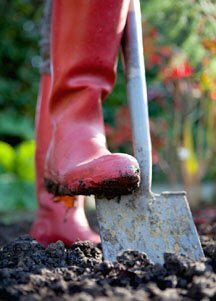 Return leaves and compost to the soil to improve water-holding capacity. Plant what you like and what likes you. Educate yourself on each plant’s specific needs so it will flourish in your garden. Buy quality plants, adaptable to a wide range of growing conditions, but matched to specific climatic needs. Plant in the fall and water regularly for good root establishment. All of our primary lawn grasses have a good to excellent rating on the drought scale. Established fescue goes dormant during the summer and requires only a single deep watering on alternate weeks during a drought. It will turn brown, just as warm season Bermuda will go dormant and turn brown during the winter. Consider using evergreen weed suppressing groundcovers in lieu of turf. Two to three inches of bark, straw, chips, compost or shredded leaves will trap soil moisture, reduce weeds, prevent erosion, feed the soil and offer a finished look to your planting beds. Water less frequently with deep watering to encourage extensive root development. Irrigate lawns early in the morning once or twice a week to achieve a one-inch equivalent of rain each watering. Buy a rain gauge and check it after every rain. Water individual plants with a hand held hose as needed. Review and practice the principles of low maintenance and low water landscaping. Develop and refine your own approach based on these methods and gain leisure time to enjoy your efforts.